1. Jennifer Squires has a new holiday card available. Cheers is printed on 100% recycled cover stock (50% of which is recycled from post-consumer waste), is processed chlorine free, and the energy used in the printing process is 100% wind-powered via renewable energy credits. These contemporary fine art cards are suitable to be used for holiday greetings and party invitations. 2. Bstudio has a nice selection of holiday cards and pillows. The hand-embroidered poinsetta and pinecone cards are beautiful. I also love the silky Christmas tree pillow. 3. A Punkin Card Company has lots of great holiday cards to choose from. The holiday deer and vintage Christmas cards are some of my favorites. 4. I love dogs & Big Max's Studio has wonderful holiday cards featuring one of my favorite breeds, Labrador Retrievers. The Yellow Lab Merry Christmas card is perfect for our family, because we have an amazing yellow lab named Beau Bradley! 5. Color Box Designs' cards feature unique letter pressed illustrations, such as the caroler seen on the Jingle Bells holiday card. The monogrammed letter pressed cards make great gifts, as well. 6. I love Polkadot Shop's holiday cards that are created using various fabrics. 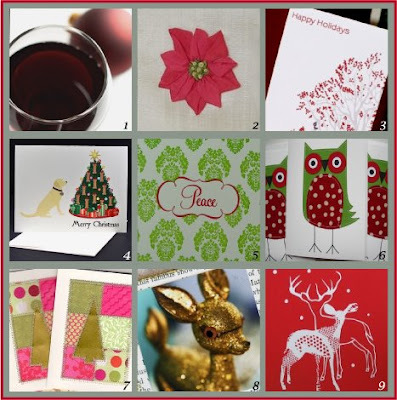 The green & red owls and stitched Christmas tree cards are fantastic! 7. Winemaker's Sister, one of my favorite crafters, has created lovely paper quilt cards available in a range of color schemes. The red & aqua cards are beautiful. And the wool felt holly brooch is a fun accessory for the holiday season. 8. Stacey Winters' selection of cards & ornaments features vibrant photographs of vintage pieces. Santa's Elves is adorable & I love the vintage golden deer. And the 2009 card is perfect for wishing your loved ones a happy new year! 9. Foxy & Winston screen prints cards that showcase brilliant, opaque and velvety colors that are unique to the medium. I love the Alpaca Family that wants to send Warm Wishes to everyone. And the Jingle Bells card, featuring a pack of Guinea Pigs I believe are pulling a sleigh, is about as unique as you can get! I love the assortment of holiday cards. Thank you so much for including my Cheers 100% recycled holiday card! Thanks for including my card! You guys rock my face off! Thanks so much for including me in this terrific group!